It is a beautiful round brown spider with intricate markings on it's underside. Next time it comes out in decent lighting, I'll have to take a picture. Makes me want to pull out my old copy of Charlotte's Web. 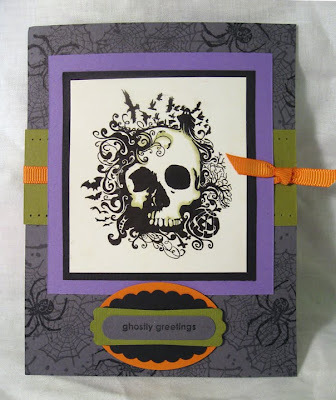 Can you see a general trend with my Halloween cards yet? I am using the same colors in all my cards so far to focus on a design only instead of design + color. These are darling Beca!! Can't wait to see them in person.... you gotta tell me how to make my blog look better... I'm such a rookie. LOL. Sandra. Oh wow! Halloween IS right around the corner huh? Love it!! 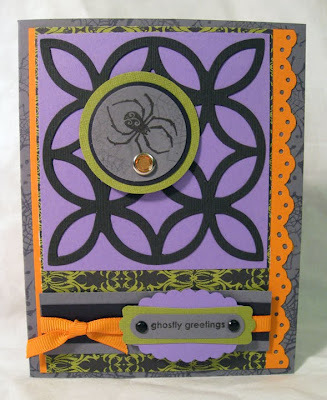 what fun "spooky cards" I have that die and have not used it, thanks for the inspiration....have a wonderful day!